Workers across China have joined a large-scale online network in response to a new working hours system implemented by supermarket Walmart. in just a few weeks, according to Wang Shishu, the group’s co-founder. Wang explained the implications of Walmart’s new working hours system on WeChat – China’s most widely-used messaging app – prompting thousands of employees to join the network, NGO China Labour Bulletin said. Photo: Walmart China workers official blog. 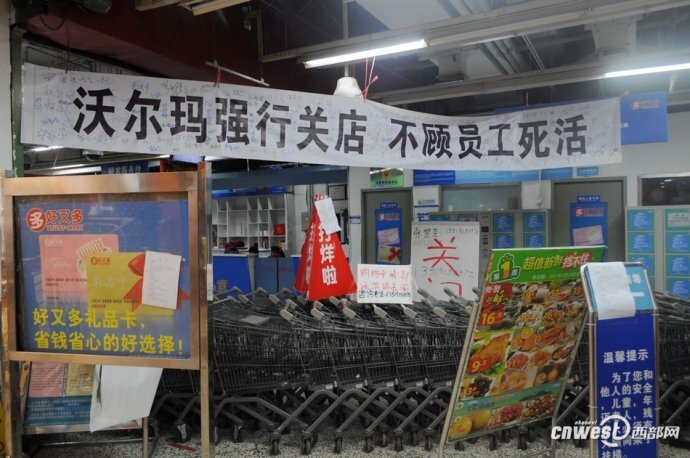 Workers are concerned that the supermarket’s new flexible working hours system will jeopardise their fixed hours and force them to resign to save the company from doling out severance pay, they claimed in an open letter addressed to the All-China Federation of Trade Unions (ACFTU). It was signed by up to a thousand workers. A banner protesting a store closure. Photo: Walmart China workers official blog. “Actively pushing the union to do their job is the best course of action,” Wang Jiangsong, a Chinese labour relations expert, told China Labour Bulletin. Last month, an official at a local federation in Nanchang helped broker an agreement between Walmart management and worker representatives which guaranteed that the new working hours system would be voluntary, the Walmart China Workers’ official blog said. Wang’s online network is facing obstacles such as online trolls and investigations by the National Security Bureau. The bureau is concerned that the group may be receiving foreign funding.